Schooley Caldwell has been working at the Joseph P. Kinneary US Courthouse since the 1980s, as the result of a series of GSA on-call/IDIQ contracts. Listed in the National Register of Historic Places, it is a significant riverfront building dating to 1931. The Kinneary Courthouse was part of a downtown civic center development effort that sprang forth following a devastating 1913 flood in Columbus. Each of Schooley Caldwell’s projects has been carried out, and the construction phased, to allow the Courthouse building to remain fully occupied and operational, which is a significant challenge, considering the very limited swing space available within the building. One of the larger renovation projects at Kinneary involved the reallocation of 68,000 sq. ft. of offices and public spaces. Space planning included creation of new judges’ chambers and suites; court support spaces; library spaces for the U.S. District Courts and the United States Magistrates; probation and pre-trial services agency offices; a grand jury room and support spaces; and accommodations for the United States Marshals Service. Schooley Caldwell’s mechanical and electrical work in Kinneary highlighted our team’s ability to sensitively incorporate systems and technology with the least possible disturbance to the Courthouse’s tenants. Schooley Caldwell has designed full sprinkler integration and modern addressable fire alarm systems in the building, as well as Direct Digital Controls (DDC) for the HVAC system. Our team has also designed numerous security improvements. Our most recent contract included repair and restoration of the sandstone façade, as well as replacement of the windows. As part of this project, designed in association with IDEA8 Architects, Schooley Caldwell also created the first-ever BIM model of the Courthouse building, created to become a long-term tool for managing the building. 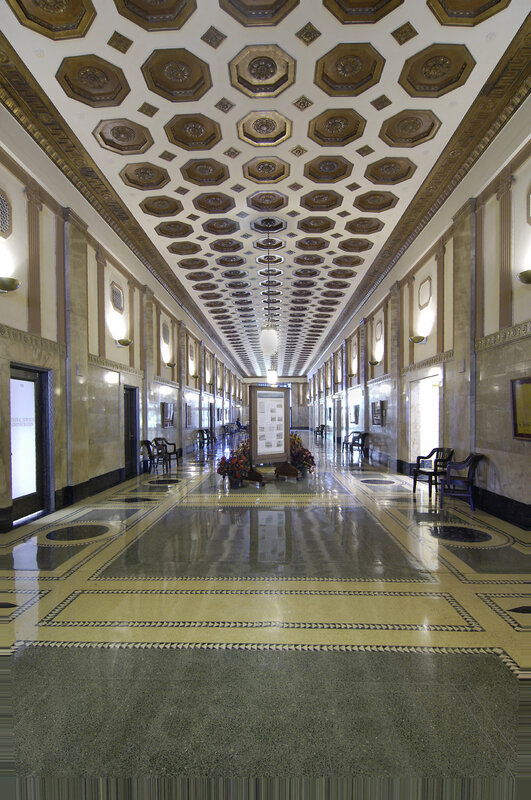 The Courthouse has also recently achieved LEED Silver certification.